A favourite moment of working with you all was when everyone shared their song gifts. It was when the group really showed how close knit it was, listening and supporting each other. We also remember eating lunch together in the church (a certain amount of cheese left on the floor!) and practicing Leanings in the big gym Hall. We’ve thought about you all a lot and your stories; Chloë’s dad in the greenhouse, Nicola’s dad on his bike and Katie and Steven’s trip to buy a car. And then the show! Seeing grins from Meg and Jack in Whitney and hearing Roger telling of his grandchild repeating the helicoptering hand dance of his daughter. We had such a beautiful, joyful and thoughtful time with you lot, THANK YOU! Thank you to Strike A Light. 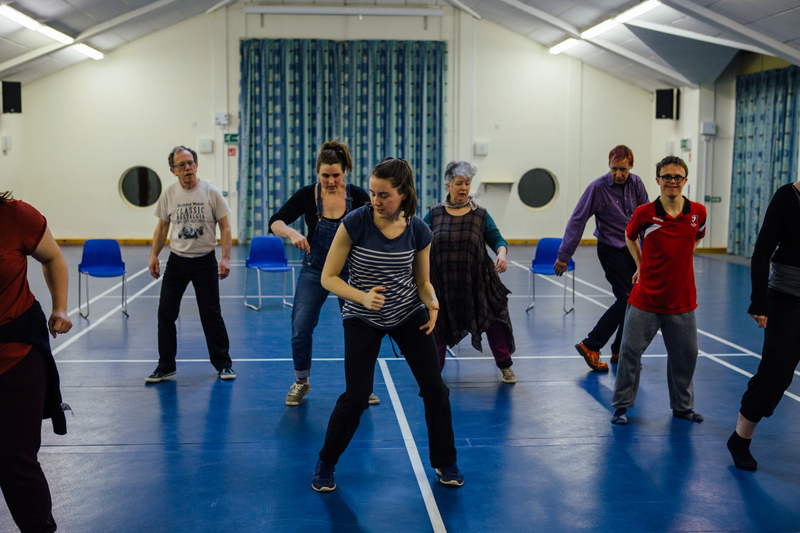 Dad Dancing is touring to Strike A Light as part of the Collaborative Touring Network project. The Collaborative Touring Network is supported by Arts Council England Strategic Touring Fund, Esmée Fairbairn Foundation and Garfield Weston Foundation.